The Crawford Fund was pleased to support the recent International Wheat Conference and Borlaug Global Rust Initiative workshop, with media assistance for both events. This international gathering of 600 from over 70 countries included the world’s top wheat scientists and a discussion of a myriad of issues relating to wheat. It provided an opportunity to raise awareness of key issues around the role of wheat in global food security. 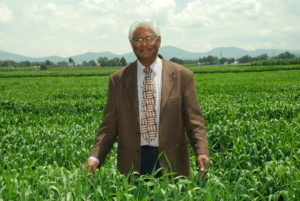 Dr Sanjaya Rajaram, 2014 World Food Prize winner and the inaugural Crawford Fund Derek Tribe award winner, who was keynote speaker at both events, penned an opinion piece on the topic of GM Wheat and World Hunger. The piece was picked up in print and online, and in a range of interviews organised for Dr Rajaram, he argued that combining biotechnology with conventional breeding methods may be the only means of helping smallholder farmers and large corporate farm systems avert global famine. You can read his opinion piece in the Weekly Times. Internationally renowned Australian agricultural economist, Professor Philip Pardey from the University of Minnesota, presented the first ever global assessment of the world’s three wheat rusts. This included maps of the global vulnerability of wheat to each of the rusts, the crop losses involved, and the global research investment implications to avoid or avert these rust losses going forward. He explained in a range of interviews that the lack of funding for research on resistance to wheat rusts makes no economic sense. Others involved in the research were from the International Maize and Wheat Improvement Center (CIMMYT); the University of Sydney; CSIRO; and the NSW Department of Primary Industries. An example article is here in Fairfax media, with Prof Pardey arguing for more funding for R&D on wheat rusts. Dr Hans Braun, Director of the Global Wheat Program at CIMMYT and the CGIAR Research Program on Wheat, reported to Radio National Breakfast and other outlets on concerns with the impact of anti-wheat fads on the viability of the wheat industry. And the Fund’s ACT Coordinator, Dr Tony Fischer, was interviewed and argued the benefits to Australia from aid spending on wheat breeding on ABC Rural. These were just a few of the many stories covered by national media in Australia from the wheat gatherings. A full list of coverage, with links as available, is here.